Cute little white fancy pant diaper covers are 65% Cotton/35% Polyester with elastic waist and leg openings trimmed with white eyelet. Embroidered with any design you would like on bottom! Accent bows give an added cute touch. Available with bows in baby pink, hot pink, red, brown, black, turquoise, purple and lime. Other colors may be available convo me to see! Use comments at checkout to tell me what you would like embroidered on bottom! Baby Girls Birthday Hat and Matching Bloomers Diaper Cover Set embroidered with birthday year number and child's name. 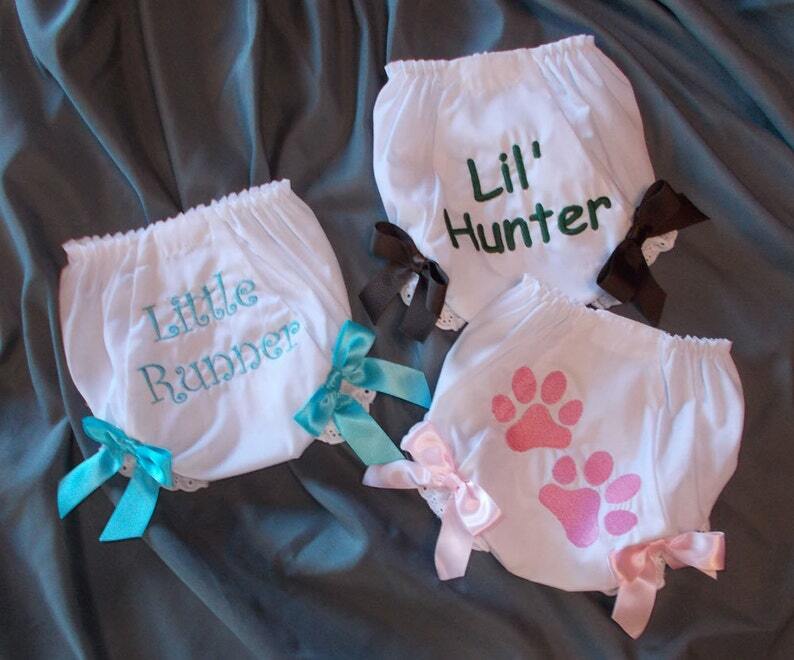 Bandana Print Bloomers Diaper Covers. Several colors! Baby Infant Toddlers Sizes 3-6M 6-12M 12-18M 18-24M 2T 3T 4T 5/6. Personalized Girl Little Owl 1st Birthday Hat and Matching Bloomers Diaper Cover Set Cake Smash Set. First Birthday Owl Whoo is Turning One?